Everyone dreams of hitting it big playing roulette, dropping a chip on the right spot on the felt, and walking away with an absolute killing. When it happens, it's pretty unbelievable. If you're new to roulette and you're wondering how people win, you'll want to read this. We've put together some facts and figures regarding roulette wins, and we've tossed in some roulette scams and stats, too. Read on for the whole deal. Imagine walking into a casino with $5 to your name. You drop it on red at the roulette table and hope that your colour hits. If it does, you've got $10. If it doesn't, you've got no cash. Well, Ashley Revell did just that. But instead of $5, it was $135,300. Nope, we're not kidding. Revell wasn't rich by any stretch of the imagination. He was simply incredibly crazy. He bet his entire life savings on a single roulette spin, opting for red. And he quickly found himself in the black with a major win that pumped up his life savings to $270,600. Some roulette players have amazing nights at the tables. They drop a few hundred bucks on the table and leave the table with thousands. And believe us, if we had that kind of luck, we'd be ecstatic. We can't even imagine what it'd be like to live this story. In 2005, a British retail tycoon named Philip Green won approximately £2 million playing roulette at a London casino. This didn't just make waves among the casino playing community - it made headlines. And it affected the casino in a big way. How big? Well, London Clubs International, which owned the casino that Green played at, actually saw its profits fall significantly because of the massive win. They say the eye in the sky is always watching. So if you're thinking about cheating at the roulette tables, don't. The law will catch up to you - or at the least the big guys in the expensive suits will. But that didn't stop Francis Farrugia and two buddies from cheating casinos around the world. Using a "top hatting" system, the three distracted croupiers and dropped a high-value chip on a winning number. And they got away with it for a good 20 years. Thankfully (at least for the casinos), the surveillance systems in London put a stop to the madness. Roulette is actually fairly easy to win. That's because there are a ton of bets that offer you a near 50% shot at winning. On a typical American Roulette wheel, there are 38 numbers - one through 36, a single zero, and a double zero. The numbers one through 36 are evenly split between red and black, and of course there's also an even number of evens and odds. That means you can bet on 18 numbers at once out of a total of 38 numbers. And that means your odds against winning are 1.111 to 1, which amounts to a tiny house edge. The fewer numbers in your roulette bet, the lower your odds are of winning. So if you drop a chip on a single number, you're looking at 37 to 1 odds against winning. Of course, if you actually hit your number, you'll net a payout of 35 to 1. On a $100 bet, that's $3,500. However, the chance of a big pay day does not make the bet any better. The truth lies in the math! People love roulette, and even though there are a few different variations, they're pretty much all identical, except for the number of zeros on the wheel (American has two, European and French have one). Most roulette players don't like change, which is why new variations of roulette haven't really caught on. One of them is a branded progressive roulette game that involves the numbers 0 through 9 repeated three times in three different colours, for a total of 30 numbers. While the game looks interesting, it never really took off because it didn't resemble anything roulette players were used to. Looking for a place to play? 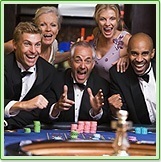 We've rated and reviewed loads of online roulette casinos. Read what we have to say and make your mark at the tables.